This is the debut album by the AlmugiFind albums by this artist quartet, led by Danish cornetist / composer Mads la CourFind albums by this artist, which also includes clarinetist Lars GreveFind albums by this artist, bassist Andreas LangFind albums by this artist and drummer Kasper Tom ChristiansenFind albums by this artist. The album presents nine original compositions, all by la Cour. 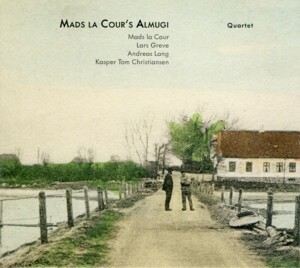 Christiansen, Lang and la Cour were members of the QuartzFind albums by this artist quartet, which recorded a debut album almost a decade earlier and which was also released at the time on the excellent German WhyPlayJazzFind albums on this label label. These musicians are all very experienced players, having participated in numerous recordings as leaders and sidemen and played countless gigs, so there is nothing surprising about their proficiency and brilliance. Their functionality as a group is also beyond reproach, both when playing straightforward and improvising. The cornet solos are excellently structured and for some strange reason bring an association of the work by Don CherryFind albums by this artist in the early Ornette ColemanFind albums by this artist´s quartets. Of course la Cour has his own individual language and this is just a nostalgic whim on my part. He also weaves excellent melodies, which serve as vehicles for the quartet to improvise and express the individual statements. Greve is very expressive and skillfully uses the clarinet and bass clarinet to create atmospheric layers and solos, expanding the sonic scope of the music. The rhythm section is, as usual, exceptional. Lang and Christiansen are already well known for their skills and adaptability to every imaginable musical setting, and they don´t disappoint here as well. Overall this is another superb album coming out of Denmark, where Jazz is enjoying an impressive Renaissance in the last decade, which makes all connoisseurs of Scandinavian Jazz extremely happy. Very well done indeed and I am looking forward to hear more from this group in the future. Two more albums: a duo and a large ensemble recording by la Cour are also available.